Blockchain has gone from a cryptocurrency base to a solid foundation for various industries. 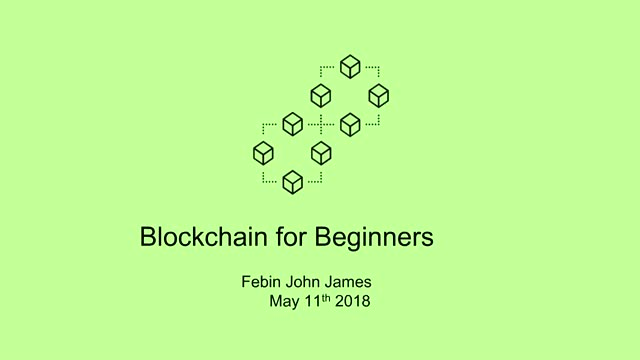 Learn how to develop blockchain applications that analyze and innovate with our expert, and ask any burning questions you have. Febin John James, CTO at Boutline and author of "Cloud Is a Piece of Cake, Fight The Blue Whale"
The design of the internet came with a fundamental flaw. A flaw that hunts it to this day. The internet was never built with an identity layer. A great part of the chaos we find ourselves in today is related to a multitude of players with wide-ranging agendas trying to fill this gap. This gap led us to a strange place to be. There is no unified you, online or offline. Arwen Smit is the author of Identity Reboot, available November 2019. Find out more at www.arwensmit.com. In the age of algorithms, A.I.-driven multinationals and an interconnected, global population, our personal identity is more important than ever. One of the symptoms of our data-driven society is the centralisation of A.I. The hoarding of data by the tech giants and the centralisation of A.I. go hand-in-hand, with far-reaching consequences. This talk challenges that notion: Maybe the future of AI shouldn't be centralised. Arwen Smit is the author of Identity Reboot, available November 2019. Find out more at www.arwensmit.com. The blockchain revolution of the past 10 years has seen the biggest surge in open source projects with 90K+ Github repositories dedicated to blockchain (DLT) projects. This massive paradigm shift to decentralized computing has also advanced the field of cryptography with exciting new math that will deliver on the promise of privacy like never before. With over 20 years enterprise software and cyber security expertise, Ricardo Diaz, today is the founder of Blockchain CLT, a blockchain consultancy. He will discuss the future and evolution of trust with innovative privacy technologies powering blockchain projects today and in the future. In the age of algorithms, A.I.-driven multinationals and an interconnected, global population, our personal identity is more important than ever. With the rise of the internet, our online and offline worlds started to merge, and what identity is and isn’t has become less defined and more complex. In this timely talk, Arwen Smit explains why identity is the most valuable thing you own, standing at the core of your every online and offline interaction. Driving home that when algorithms shape our reality, we humans become the input and output of algorithms. Arwen Smit is the author of Identity Reboot, available November 2019. Find out more at www.arwensmit.com. The goal of this brief is to quickly introduce Blockchain analytic dashboard usages. It could be said that the average person has no idea what Crypto-Currency is nor, can they explain how the technology works. Some would agree more people are now beginning to comprehend crypto-currencies like Bitcoin are simply some type of electronic investment instrument as in the American dollar. However, most individuals in the general population still don’t grasp the potential value of blockchain platforms. Nevertheless, a lot of technologists, researchers and professionals understand distributed ledgers are used to process and store user data associated with various types of transactions within blockchains. We will discuss our views on homomorphic encryption for voice, and blockchain and "Blockchain zero knowledge proofs." We will cover use cases for Homomorphic encryption (HE) that is applicable in secure voice conferencing for untrusted environments such as cloud applications. The thinking is that not having a central decryption point, cyber based cached attacks such as TLBleed would not be able to have any effect. This can secure voice in tactical environments. We define tactical as any environment that has limited computing resources, rapidly changing mission requirements, limited connectivity, and high stress. Such environments are typically tactical military deployments, public safety, or government field offices. We’re still in the early days of Blockchain as a technology, and so we’re yet to see the full impact that it will have on the world that we live in. Still, it’s already showing potential across a range of industries and started to enter the public consciousness, so the real question is what will happen when Blockchain technology starts to mature. Right now, speculating on the future of Blockchain is like trying to predict the future of the World Wide Web in 1990. It’s just too early to say for sure, but we can at least be reasonably certain that it’s going to continue to grow as more and more uses cases are found for the exciting new technology. Blockchain will face many changes and obstacles but still provides many promising applications; this webinar discusses both challenges and applications of Blockchain technology in 2019 and beyond. We will discuss Smart agreements on Blockchain and how to create Blockchain powered Smart agreements. It is time for intelligent and self-aware contracts. Create, execute and maintain legal contracts that can be highly customized and automated with a platform powered by Blockchain, Internet-of-Things and Artificial Intelligence. This can ensure secure authentication, minimize fraud and provide complete control of your identity and ensure your privacy. What does the bank of the future look like? What are the opportunities and challenges that technology brings to the payments ecosystem? -How can data make banking more effective for the modern-day consumer? -What are the latest trends in new payments platforms and models? -How are different industries like eCommerce, retail, and insurance affected? -What are the effects of GDPR and Open Banking? -What does connected financial services look like? - Working on the edge of blockchain technology product development. Listen to Last week in blockchain for week 15 of 2019 dedicated to the Odyssey Hackathon last weekend. I'll be talking about 4 of the 20 solutions build there. "How can incumbents deliver meaningful game-changing innovation?" 2. Perhaps tech transformation is the way forward, partnering or acquisitions to do so? 3. Or do they need to achieve business model transformation by building something entirely new outside of the organisation? These options are being heavily debated in boardrooms throughout Europe, with a number of high profile banks recently announcing plans to build brand new subsidiaries. Some of the traditional banks, payments and tech companies are pursuing a few or all of the options while others are sitting on the fence. Which is most effective and why? What are the dynamics at play that determine success for different types of companies? Hear from the leading companies in our industry as they share their incisive insight on the successes but also the failures and the lessons learned. blockchain strategy is potentially missing the next big digital gold rush. who will discuss these questions and more for this engaging panel. We will discuss blockchain forensics and cryptocurrency anti-money launderingthe. 20 top cryptocurrency exchanges globally that revealed that 97% of direct bitcoin payments from identifiable criminal sources were received by unregulated cryptocurrency exchanges. We will also discuss Use Cases in digital asset businesses, regulators and law enforcement on investigations, analytics and anti-money laundering. John also led blockchain initiatives at Samsung Innovation Center. We will present the challenges of Key Management in Blockchain and discuss cybersecurity, Cryptography, Strong Authentication, Multi-Party Computation and Blockchain. AI, machine and deep learning are making strides in organisations. However, the results of the projects will start to lose their effectiveness as the business environment evolves over time. In order to keep the AI fit and effective you need to rapidly evolve into Model Operations or ModelOps. Rather than provide you real world examples of AI in action we will give you a peak behind the machine of how you keep AI working in the real world. Gary is the Managing Director for Emerging Technology at 6point6. With over 17 years’ of consulting experience, Gary leads a team of data scientists and data engineers in the agile development of Blockchain, AI and Machine Learning solutions. The focus of the team is bringing a collaborative approach to analytics, underpinned by machine learning and data engineering. He believes mainstream business adoption of AI solutions are the key to accelerating innovation enabling businesses to compete, reduce cost and ensure compliance. Prior to joining 6point6, Gary was the Head of Data Engineering at KPMG focussing on blockchain and bringing sound data engineering to the world of AI. Blockchain is all over the news nowadays, but what does it mean to the automotive industry? How could blockchain address these challenges? Blockchain technology has taken the world by storm. From blockchain 101, to the latest news on cryptocurrencies, to more advanced skills needed to get to grips with the technology, subscribe to this channel where leading experts will get you up to speed on all things blockchain and distributed ledger. MintBit was created to increase awareness and understanding about the blockchain and its use in business models. Let's take the first step on your blockchain journey - together! Presented by: Febin John James, CTO at Boutline and author of "Cloud Is a Piece of Cake, Fight The Blue Whale"